M/Y DESTINY is an attractive proposition for anyone looking for an impeccably maintained long-range explorer yacht. For a vessel of this size, her spacious dining and seating areas are second to none making endless entertaining opportunities. 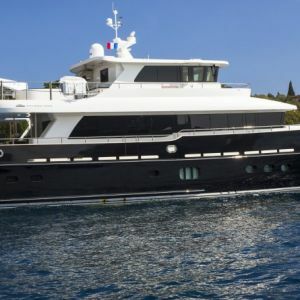 M/Y DESTINY is a super 23.90m explorer yacht built by Fifth Ocean Yachts in 2014. 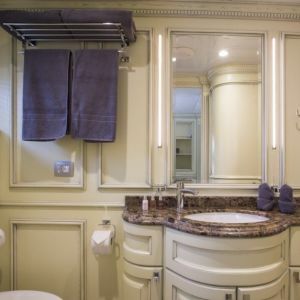 Impeccably maintained she can comfortably accommodate 7 guests in 4 spacious cabins (2 Doubles, 1 Twin and 1 Single) all with ensuite facilities. With cruising speeds of 7-11 knots and exceptionally low fuel consumption, M/Y DESTINY is an attractive proposition for cruising the clear waters of the Mediterranean. 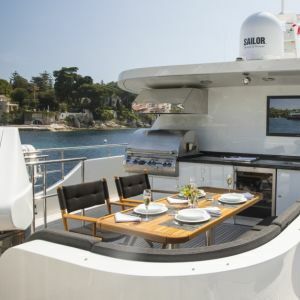 She benefits from supreme exterior dining options on the aft, top and foredecks, her experienced crew of four will entertain you in luxury and style. 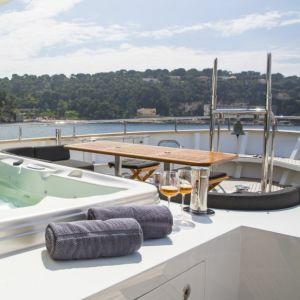 Watch the sun go down while relaxing in DESTINY’s foredeck Jacuzzi and savouring another memorable day onboard this stylish yacht. She boasts an excellent AV system equipped with Smart TVs controlled by iPad/iPhone and iPod controls. 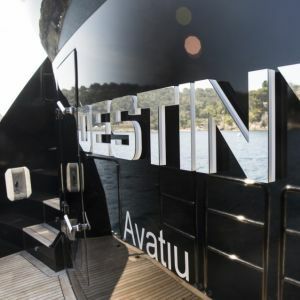 M/Y DESTINY is available to view in Cannes Old Port and attractively priced to sell at €2,650,000. Viewings are highly recommended, please contact Irina Blagodyr on +33 620 16 40 56 for further information. Bluewater Is Thrilled To Welcome Back MY QUID PRO QUO To Our Charter Fleet.